The Steadyrack Fat Rack has been designed specifically for Fat bikes with tyres greater than 3 inches. 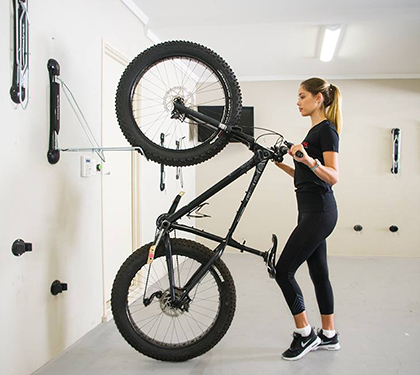 The Steadyrack Fat Rack has the ability to store various sized bikes making it ideal for the home or workplace. The Steadyrack Fat Rack features a unique swivel action that allows storage of multiple bikes side by side. This allows three positions of storage, to the right, central or to the left. The Steadyrack Fat Rack is simple to use and uses limited space. Steadyrack Fat Rack is rated 5.0 out of 5 by 2. Rated 5 out of 5 by Jackie2610 from Quality product Top quality product at an appropriate price. It is wide enough to fit all our mountain bikes and we couldn't be happier with the product. Rated 5 out of 5 by Lauren122334 from Excellent product We have been looking for suitable bike racks for our mountain bikes for some time and these fit the bill perfectly. Great value and quality, can't recommend enough!